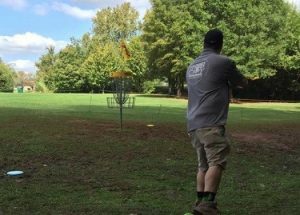 Disc golf enthusiasts in the Upstate have no shortage of options to choose from in order to enjoy the sport that has been growing in popularity since the 1970s. 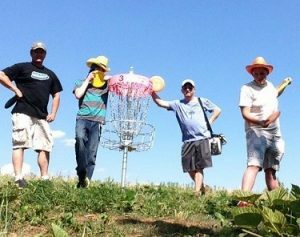 As far back as the 1920s, people have been throwing discs at targets in a golf-like game, but it wasn’t until the late 1960s, when a California parks and recreation supervisor petitioned Wham-O, the makers of the Frisbee, to supply discs for a tournament, that the seeds of the sport were planted. championship meets, and eventually, after patenting the chain baskets that are still used today in disc golf, he left Wham-O to start the Disc Golf Association, a precursor to today’s Professional Disc Golf Association, in 1976. Forty years later, there are thousands of courses across the U.S., and hundreds more in locations all over the world, including one in Mongolia and another in Togo, West Africa. 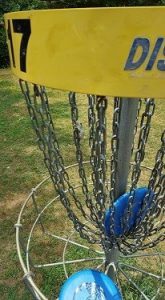 The discs have developed over the years, evolving from the Frisbees that are thrown in parks and at the beach to smaller, heavier discs that have variations in shape and weight for different kinds of throwing—but with many free courses and minimal equipment investment, disc golf is a sport that can easily be enjoyed by almost anyone. In addition to the many public courses available, colleges and universities in the region also have courses for intramural teams and recreational play: Furman University in Greenville, USC Upstate in Spartanburg, Clemson (though not officially sanctioned by the university) as well as the Clemson University Outdoor Lab in Pendleton, Wofford College in Spartanburg, Erskine College in Due West, and Lander University in Greenwood. A million cups of coffee – that’s what, according to the Ewing Marion Kauffman Foundation, connects entrepreneurs in over 180 communities in the United States to the resources and solutions needed to help start or grow their business ventures. 1 Million Cups (1MC) is a program of the Kauffman Foundation, which seeks to “fulfill its mission to educate, engage and connect entrepreneurs with their communities.” Three communities, of the aforementioned 180+, are here in Upstate SC. 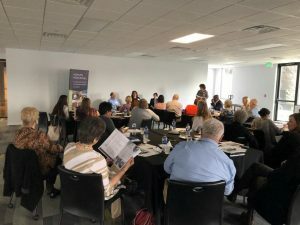 Anderson, Greenville, and Spartanburg counties regularly host local gatherings of entrepreneurs and their support networks. The format is simple: Each month, entrepreneurs present their ideas and startup companies to their local ecosystem partners in hopes of gaining valuable feedback on how to best grow their business. Typically, each 1MC gathering sees one to two entrepreneurial presentations, followed by a question-and-answer session with the audience. The benefit here is two-fold. First, entrepreneurs are able to gain genuine feedback regarding their ideas at no cost. Secondly, the community is made aware of new business activity and how they are able to best support their local entrepreneurs. “1 Million Cups is like a workout for startups: entrepreneurs talk about the challenges of the heaving lifting and their goals. The audience is the spotters and coaches, challenging the founders to approach problems differently and cheering them on with connections and leads. As the Upstate continues to develop its reputation and capacity for entrepreneurial success, it is crucial that we have programs such as 1 Million Cups to champion this cause. The onramps (access points) for entrepreneurs to enter the ecosystem must become smoother and be available to all Upstate citizens, regardless of their background. Meets the 1st Wednesday of each month at Ciclops Cyderi and Brewery in Spartanburg. Please visit the Upstate Business Ecosystem Resource Map to find ecosystem partners in your area. Do you or your organization provide support to entrepreneurs or small businesses in the Upstate? Consider joining TATT’s Entrepreneur Support Providers Network on March 20th, 2019 for our first workshop of the year. The network will be reviewing lessons learned in 2018 and looking ahead to building the regional awareness and capacity during 2019. Register here for the March 20th workshop. On February 7th, Ten at the Top’s Upstate Senior Issues group reconvened for their first session of the new 2019 Senior Issues Workshop Series. moving forward, that this group must be more intentional with their approach to address senior needs collectively. After much conversation, the group decided to move forward with topic-focused meetings that address the top senior needs in our region. The Appalachian Council of Governments proposed that the group utilize data from their 2018 Senior Needs Assessment, which was conducted in early fall. It was agreed that these topic-focused workshops seek to address the most pressing senior needs that were identified in this assessment. The workshop series will address topics such as food access, transportation, and senior household needs. The first session was surrounding lifelong learning opportunities in the Upstate. Lifelong learning is an important topic of discussion because studies show that those who are well connected to family, friends, and community are happier and physically healthier, and they live longer than those who are less connected. The group engaged in a thoughtful dialogue about lifelong learning and other social engagement opportunities available in the Upstate. They also talked about the challenges of reaching parts of the senior population with these opportunities. Those 60 and older can audit courses at no charge at state colleges, universities, and technical schools. The goal of these discussions is to raise more awareness than ever before of our seniors in the Upstate and the issues they face on a daily basis. The workshop series is sponsored by Upstate Home Care Solutions and the Better Business Bureau (BBB). Throughout its over-300-year-history, South Carolina has been impacted by the contributions of African Americans. With around 50 Upstate properties associated with that history listed in the National Register of Historic Places or recognized with South Carolina Historical Markers, one does not have to go far to experience firsthand a wealth of buildings, structures, and sites that document the state’s African American heritage. Although there are too many to note all of them, several stand out, allowing area residents to begin to more fully understand and appreciate the contributions of African Americans to the rich history of our state. From slavery to freedom and from segregation to equal rights and beyond, these historic places remind us of the courage, endurance, and achievements of black South Carolinians. 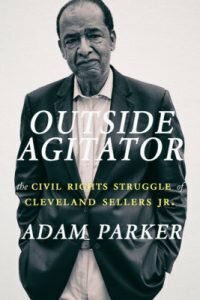 Spartanburg-based Hub City Press published Outside Agitator last year, a biography of Cleveland Sellers. Sellers, who was scapegoated and did prison time in the aftermath of a horrific event called the “Orangeburg Massacre,” was later exonerated and went on to be and outstanding educator in addition to continuing his activism. He served as the director of African American studies at the University of South Carolina before going on to be the president of Voorhees College, one of ten HBCUs (historically Black colleges and universities) in South Carolina. On the night of February 15, 1947, white cab driver Thomas W. Brown was found mortally wounded beside his cab in Pickens County. Earle, a young black man, was thought to be Brown’s last passenger, and he was arrested near Liberty on February 16, accused of assault and robbery, and held in the Pickens County Jail. Early on February 17, 1947 things turned violent as a white mob forced the jailer to surrender Earle. The group drove Earle back to Greenville, lynched him, and left his body on Bramlett Rd. Tragically, Earle died later that day. The lynching was the last recorded in South Carolina and one of the last in the South. Dr. Benjamin E. Mays: The “Spiritual Mentor” of Martin Luther King, Jr.
On January 28, 1963, Clemson University became the first white college in South Carolina to integrate. Harvey B. Gantt, a Charleston native wanting to study architecture, had applied for admission in 1961. But when Clemson delayed admitting him, he sued in federal court in the summer of 1962. President Robert C. Edwards, meanwhile, worked behind the scenes to make plans for Gantt’s eventual enrollment. Edwards and several leading businessmen, politicians, and others drew up an elaborate plan. Described as “a conspiracy for peace,” the move was designed to ensure that Gantt would enter Clemson without the protests that marked the integration of other Southern universities. A complete list of African American Historical Places and Markers in the Upstate can be found on the South Carolina Department of History and Archives website. The guides are located in the right column, organized by county. Please note that most of these historic places are on private property and not open to the public. 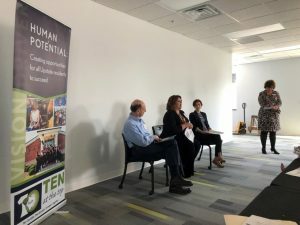 Upstate, SC [February 5, 2019] –Ten at the Top (TATT), a non-profit organization created to foster collaboration and planning in South Carolina’s Upstate region, has announced its new board members for the 2019-2021 term. They join existing members to form the governing board for the 10-county non-profit organization. The TATT Board of Directors is composed of public, private and civic leaders from across the 10-county Upstate region. TATT board members are charged with representing the region and their community in fostering trust and collaboration across the region on issues of regional significance, serving as an advocate for regional thinking within their specific city or county, assisting TATT in engaging elected officials, business and community leaders, and supporting general organizational functions.